The power struggle, party insiders say, poses grave threats to RJD’s prospects in the Lok Sabha and the 2020 Assembly polls. PATNA: With RJD chief Lalu Prasad Yadav lodged in jail due to his conviction in fodder scam cases and battling ailments, his first family is going through a major crisis — rising acrimony and differences between his two sons over how to run the party. Tej Pratap and Tejashwi are leading the RJD in consultation with their mother Rabri Devi and a group of senior leaders. But rising differences between the brothers have led to a stagnation in RJD’s outreach programmes. 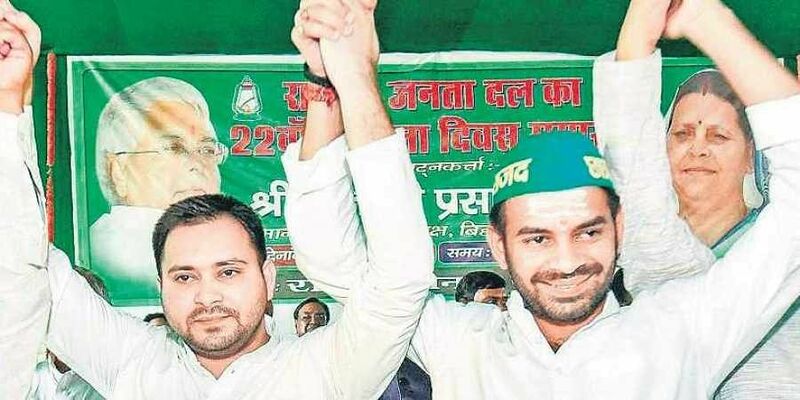 Tejashwi, L eader of the Opposition and RJD’s de-facto chief, has already been named as Lalu’s political heir. He is reportedly unhappy with Tej Pratap for frequently letting his displeasure known about party affairs. Tej Pratap had complained on the social media that certain ‘elements’ were busy sidelining him and that his mother was not listening to him. Both brothers have rubbished speculation of a rift. But the feud was visible when Tej Pratap skipped an important RJD meeting last month that discussed the party’s stand on demands for reservation for the upper castes. Sources said Tej Pratap, who supports the demand, was upset because the issue was not discussed properly before Tejashwi rejected it. Tej Pratap, who served as Bihar’s health minister, was unhappy about Tejashwi refusing to associate with his padyatra programme from Patna to Sitabdiara, the ancestral village of Jayaprakash Narayan. Tejashwi was scheduled to flag off the much-hyped programme, but he skipped it after keeping the gathering waiting for hours. After Lalu and Rabri’s eldest daughter Misa Bharti spoke of the differences between her two brothers earlier this week, the speculation was validated. “Even all five fingers are not of equal length. In my family, there are differences between my brothers. RJD is a much bigger family,” she said. Later, the family and other leaders said she was speaking metaphorically. Lalu and Rabri’s eldest daughter Misa Bharti spoke of the differences between her two brothers, validating the speculation. “Even all five fingers are not of equal length. In my family, there are differences between my brothers. RJD is a much bigger family,” she said.